Your BeeSafe Lawn wants to breathe! From the time you make your first cut of the year until you put the mower away for the winter your lawn may become compacted. Aerating in the fall can be a vital step in correcting this problem. 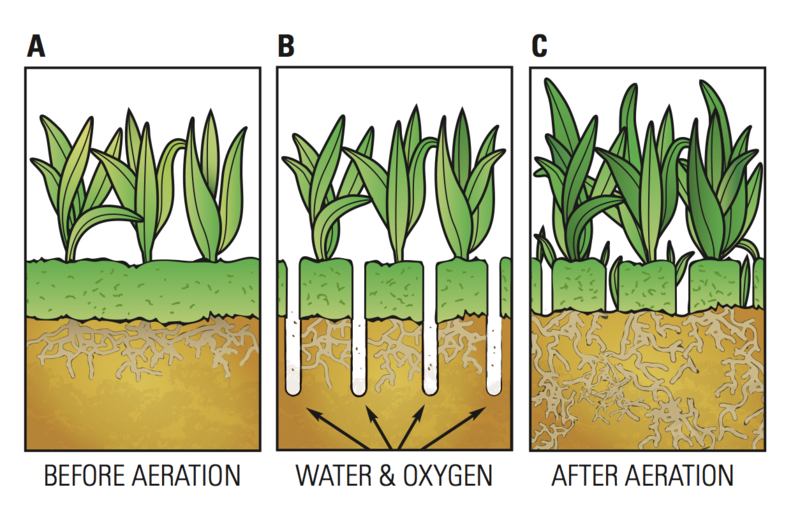 The aeration process includes removing small plugs of soil to allow air, water and nutrients to reach the roots helping them grow deeper and stronger. The cores pulled from the soil leave holes which create a beneficial environment for fertilization. After you’ve aerated and the plugs of soil have dried out, mowing the grass at a slightly lower level than usual will break up and distribute the soil. The loosened dirt creates a good place for seeds to take root. How can you tell if your lawn needs to be aerated? Well, if it gets a lot of traffic from pets or children, dries out easily or has a layer of thatch, aeration can be a lifesaver for your grass. Not sure if your lawn would benefit from aeration? Your BeeSafe Lawn applicator can certainly help you out with this and many other lawn care solutions. This article was posted in Blog, Cultural Practices.